Budget quad core phones from Xolo, namely Xolo Q700 (Full Review) and XOLO Q800(Quick Review) are quite popular and provide a good performance option for those seeking phones below 10,000 INR. Xolo launched another 1.2 GHz quad core phone, Xolo Q900 yesterday priced at Rs. 12,999 let’s take a look and find out what makes it stand apart from rest of the phones in the Q series and justify its pricetag, something Xolo Q700i didn’t do quite convincingly. The Internal storage is standard 4 GB and is similar to what we have seen in all smartphones in this price range and those much below this price range. The memory can be further extended to 32 GB using MicroSD card. This phone is powered by MT6589 SoC which is a Quad core processor clocked at 1.2 GHz and assisted my PowerVR SGX 544 MP GPU which is clocked at a frequency of 286 MHz. The Xolo Q800 and Xolo Q700 are now shipping with MT6589WM which is WCDMA version of MT6589 and does not differ much in performance. The RAM capacity is 1 GB and will give you smooth multitasking and is standard in this price range. The battery capacity has been reduced from 2100 mAh in Xolo Q800 and 2400 mAh in Xolo Q700 to only 1800 mAh in this phone. The reduction in battery coupled with increased display size and resolution will affect your total On screen time. Xolo claims that this battery will provide you with up to 13 hours of talk time on 2 G and up to 3.5 hours of browsing on 3 G. Browsing time is 5 hours if you use WiFi. The display of this phone is bigger and better compared to the predecessor devices in Q series. This phone sports a comfortable to hold 4.7 inch display with 720p HD resolution thus giving you 312 ppi which is fine clarity display. The color depth is 16.7 M (True Color).This is the only arena where this phone shows significant advancement over Xolo Q700 and Xolo Q800. The phone runs on Android 4.2 jelly bean operating system and supports Dual SIM functionality. The phone also features a Quick Access control which lets you launch various apps from a tool bar even when other apps are running. The connectivity options include 3G, WiFi, Bluetooth 4.0 and GPS with AGPS support. This phone will compete against phones Like Lava Iris 504Q, Videocon A55 HD, iBall Andi 5H Quadro, Xolo Q800 and many more MT6589 devices that we have seen in price range of 10,000 to 15,000 INR. You can see the complete list of such phones on our price list for phones between 10,00 to 1500 INR. Comparing this phone to other phones in the Q series like Q700 and Q800, it will definitely give a better camera and better display, but market is over crowded with MT6589 phones with HD display which will definitely mark a dent in its sales. Xolo is trying to cash on its popular Q series smartphones and the improvement in display counts. The phone will be much more attractive option if it is available for the best price of around 11,500 INR in the next few weeks. 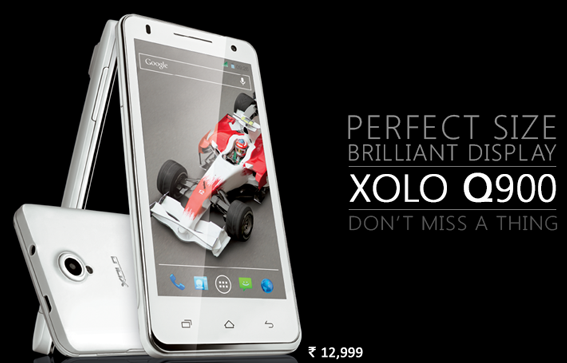 XOLO HAS COME OUT WITH XOLO Q900 MOBILE. DOES IT SEEMS BETTER THAN GIONEE ELIFE E6. Xolo Q900 specs seems good, but display size and resolution are much lower and sames applies for the storage and RAM as well, but lets see how does it perform, we will keep you posted when we do the full review of this phone. I m confused in terms of buying a smartphone………my budget is around 15000…..plz suggest me some good smartphones. you can go for gionee elife e3, lava iris 504q or zen ultrafone 701 Hd in this price point. 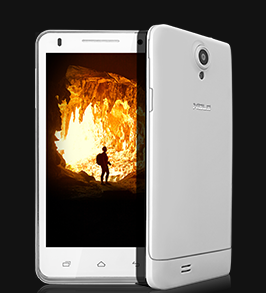 Increase your budget to 17500/- and buy GIONEE E5 online. TOO COSTLY, I WOULD LIKE TO BUY IF I GET IT IN RS. 10500/- TODAY 05/11/2013. Xolo Q900 getting in price of 9,300 …. get it now yaar .. Yes xolo q900 seems to be a great device on paper, we will let you know more once we get the review unit of this device.